Clips is a new app for making fun videos to share with friends, family, and the world. 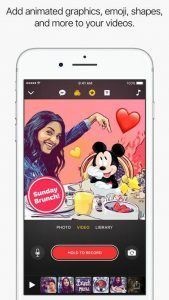 With a few taps you can create and send a video message or tell a quick story with animated text, graphics and emoji, music, and more. Before you claim it is too hard to use, do some research before. I’m guessing most of you are trying to use the live captions and title slides. The live captions correspond to your spoken voice and can be edited. The title slides text is edited when you first select it. To use it in a video, you must record while the title slide is up for it to work. Love this app and waiting for more content to roll out. Maybe addons for the app like iMessages?